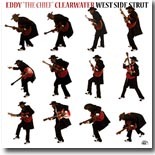 Veteran Chicago bluesman Eddy Clearwater makes his Alligator Records debut with a solid effort, West Side Strut. It's this month's Pick Hit. The Surprise pick this month features a fine acoustic performance, Songs Famed for Sorrow and Joy, from guitarist Samuel James. We return to the mid '80s for a look back at a fine album, Generic Blues Album, from Chicago multi-instrumentalist Maurice John Vaughn. It's this month's Flashback feature. Our What's New section features new releases from Honeyboy Edwards, Sean Carney, Al Basile, Ms. Jody, Stan Mosley, Joe Moss Band, Pete Scheips Band, Anthony Gomes, and more, plus a reissue of many of Magic Slim's best sides.